In what appears to be further evidence of an imminent rapprochement between Tel Aviv and Riyadh, US President Donald Trump recently told reporters that without Saudi Arabia, Israel would be in “big trouble” in the Middle East. Trump’s comments were apparently aimed at backing Saudi Crown Prince Mohammed bin Salman (MBS), who is the subject of intense global outrage over the killing of journalist Jamal Khashoggi. In the battle to defend the Saudi Crown Prince, look for Israel. It is a battle that the US President is waging against accusations that the Saudi Prince is responsible for the killing of Khashoggi. 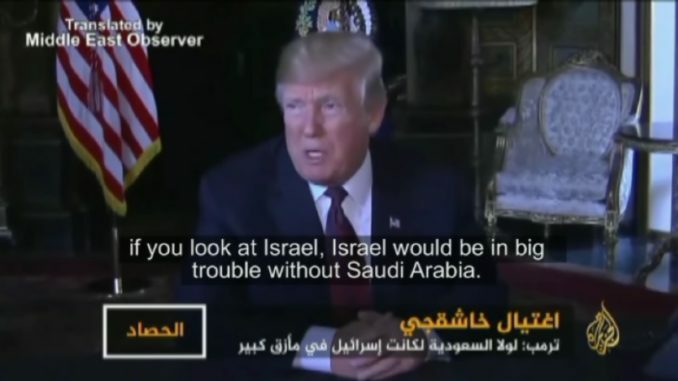 (US President Donald Trump): “The fact is that Saudi Arabia is tremendously helpful in the Middle East, if we didn’t have Saudi Arabia we wouldn’t have a big base, we wouldn’t have any reason probably…if you look at Israel, Israel would be in big trouble without Saudi Arabia. So what does that mean? Israel is going to leave? You want Israel to leave? We have a very strong ally in Saudi Arabia”. These are words that were also said previously in a White House statement days earlier regarding the Khashoggi issue. ‘Israel’ here, seems to be the codeword, and mentioning it while defending Saudi Arabia may lessen the pressure on the US President. Pressures that are increasing in recent days, spearheaded by the heads of the Republican and Democratic parties in the US Senate Committee on Foreign Relations, who both called on President Trump to make absolutely clear whether the Saudi Crown Prince was responsible for the crime or not. The pro-Israel lobbies in America very often effect the political game over there. Some of (these lobbies) went to the Saudi Crown Prince to support him during his ordeal. This meeting brought together Prince Mohammed bin Salman and Evangelical leaders. Jamal Khashoggi was one of the key issues on the agenda. On top of the Evangelical agenda is Israel, a state which is carrying out all possible efforts to normalise relations with Arab states. (Israeli PM Benjamin Netanyahu): “What happened in the Istanbul consulate was horrendous and it should be duly dealt with. Yet at the same time I say it, it is very important for the stability of the world, for the region and for the world, that Saudi Arabia remain stable”. These words suggest that Netanyahu is beginning to realise some of his hopes in (achieving) a rapprochement between Saudi Arabia and Israel. A rapprochement which seems to have begun even before Trump’s plane tour, during which he flew from Riyadh to Tel Aviv directly. This flight declared a new stage in relations between Saudi Arabia and Israel, its patron being the US President.